Caesar salad holds a special place in my heart. That might sound weird, but eating “real” is all about connecting with your food, isn’t it? 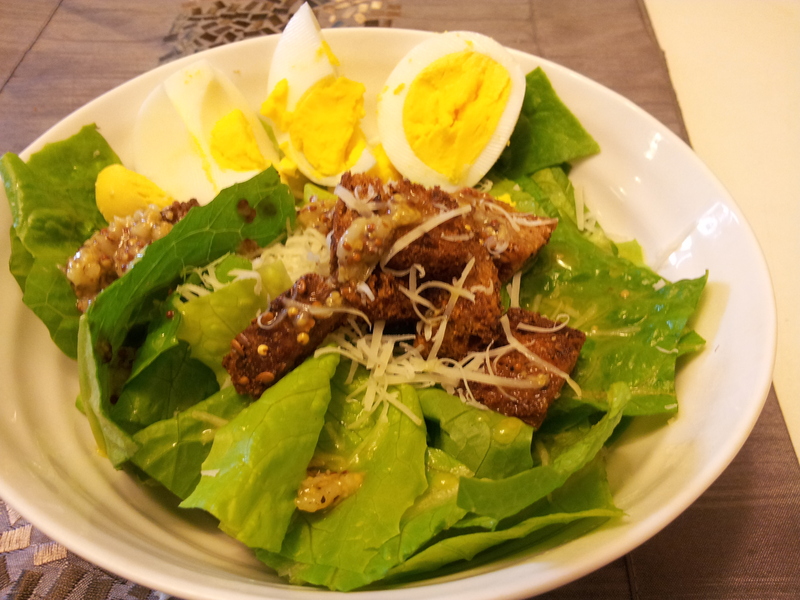 There is something satisfying about eating a giant, goopy Caesar salad. 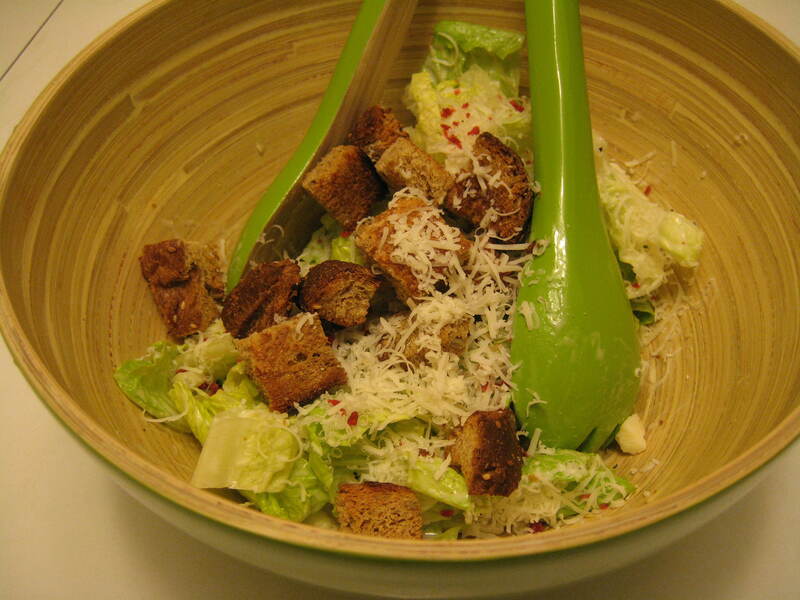 In my first and second years at university, Caesar was my go-to vegetable side dish that doubled as an after-bar snack. I introduced my boyfriend to it; he previously detested any kind of salad. While I know slathering romaine leaves with creamy dressing, adding croutons, and grating parmesan over top isn’t a really healthy meal, I felt it was a good compromise between steamed broccoli and no veggies. A good compromise, that is, until I got stricter with my vegetarian diet. I never put real bacon bits on my salad, but that didn’t mean my Caesar was animal-friendly: every bottle of Caesar dressing I could find had anchovies in it. In fact, many brands of croutons did, too. Et tu, Bruté? For several years I went Caesar-less, until I located a small company that made anchovy-free dressing (if you’re in the Toronto area, I do recommend Best Dressed with the blue label). That elating discovery was followed by homemade croutons (cheaper and anchovy-free) and tempeh bacon to replace those slightly disturbing but incredibly realistic “bacon-flavoured” bits I used to put on top. 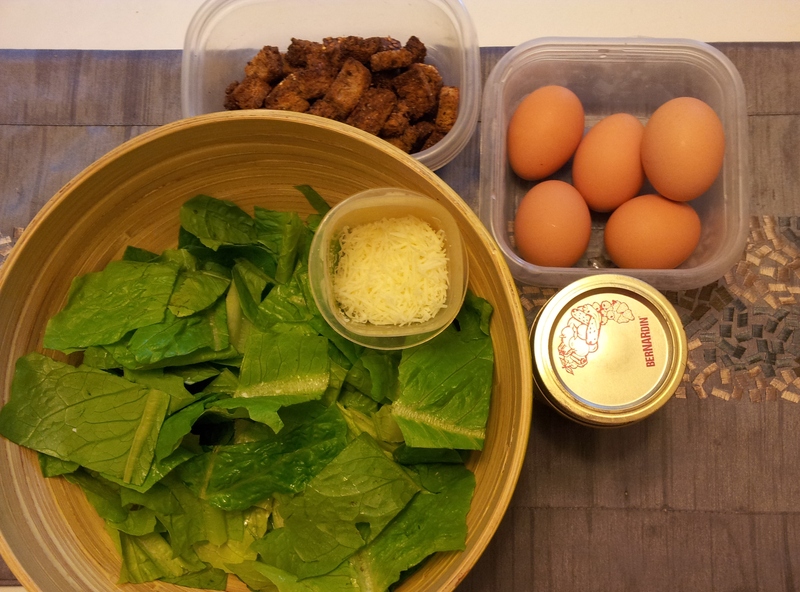 Over time, we created an entirely homemade, vegetarian, all-natural Caesar salad. And now I share this recipe for my favourite guilty pleasure with you. 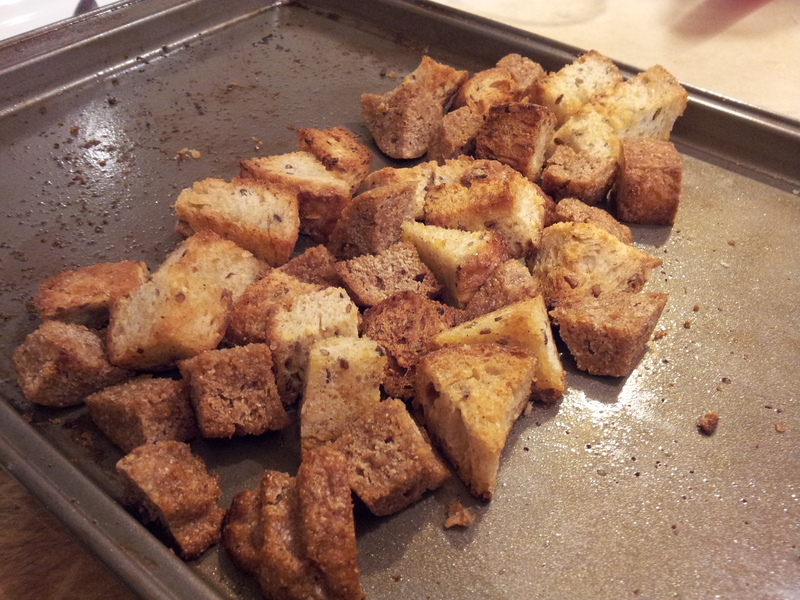 It may look like a lot of work, but you can always make croutons a day ahead. Or, accept the workload, add some all-natural whole wheat bread and a few hard-boiled eggs and call it a meal. This recipe feeds four regular people, or one Jill and one Mike. *despite what the website says, my tempeh bacon package doesn’t list maltodextrin as an ingredient. I have: organic soybeans, water, shoyu soy sauce (water, soybeans, wheat, salt, bacterial culture), molasses, maple syrup, natural smoke flavour, autolyzed yeast extract [questionable? ], salt, organic apple cider vinegar, bacterial culture. Add all ingredients to your Mason jar and shake like crazy. Sample and adjust ingredients to taste. Pour over lettuce and toss well. Place the cubes into a large bowl or baking tray. Drizzle evenly with the olive oil and sprinkle with garlic powder. Toss to coat and repeat step #4. Sprinkle generously with salt and freshly cracked black pepper. Toss gently with your hands to make sure all surfaces of the bread cubes are covered. Spread the cubes out on a baking sheet. Bake for 15-20 minutes, until the cubes are crusty and dried but not burnt. Cool before adding to Caesar salad.